Economics – ‘Prior’ to a Money System! American economics started with the settlements in Jamestown and Plymouth Rock. These settlers arrived in America from Europe and they started commerce without any official money. They traded with the Indians and also with other settlers who arrived from Europe. America did not have any official money until 1792 (some 185 years after the settlements of 1607 (Jamestown) and 1620 (Plymouth Rock). Money is invented after an economic system is adopted. Our initial settlers tried Communism (this System) and found that it did not work. They then developed private property and this system called Capitalism. Capitalism developed mostly after our Revolutionary War period (after 1776). America then invented their own money system with the Coinage Act of 1792. Thank Thomas Jefferson for his logic and his intellect. Thomas Jefferson desired a metal based coinage system for Americans. This system was approved by our first Congress and became official in 1792. A mint in Philadelphia was established and rules for minting coins and establishing the value of these coins was recorded in our Constitution (Article I, Section 8) and in this legislation. This coinage system created our money and later our prices in the marketplace. Later in 1934, after a serious economic depression, FDR and his administration abandoned this metal coinage system and established the paper note system (called the Federal Reserve Note). This note had no tie to gold or silver and it became known as our ‘faith’ money system. Our Central Bank became the trustee of this system. Faith money has worked but it now has been replaced with a new digital system since the closing of the gold window (by Nixon) in 1971. Without any approval from our Congress or our Supreme Court, our Central Bank (called the Fed) has installed and promoted a centralized digital money system for all Americans. This system is totally electronic and it uses a unit of consciousness as its money unit. This unit of consciousness gets displayed within cyberspace as a number/image. Digital units are now ubiquitous in the USA and our world as a result of this change in our money system (which evolved after 1971). Today’s digital money allows our Central Banks and their proxy member banks to create these inner digits from their consciousness (out-of-nothing). They simply type digital numbers into a computer screen and then call this official legal tender (money). The recent QE operations of our Central Banks have revealed this new system of money creation (out-of-thin-air and/or out of the consciousness) of select bankers. Since the financial crisis of 2008, this digital money system has become global and it is now part of the Central Planning which our banksters administrate globally. The central bank for all our national central banks is the BIS bank, located in Basel, Switzerland. 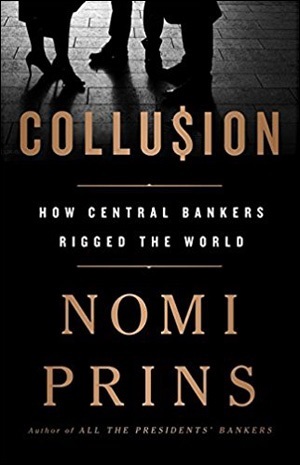 Some 60 central banks are members and they meet regularly to coordinate international finance so that our markets can grow via their regulations, manipulations, and rigging activity. Few have internalized these changes within our monetary/finance system. Money is the lifeblood of any economy and today we live with inner money units which originate from our Central Planners (called our central banks). All money is now electronic (with the exception of some 5% which is still paper and coin). We can say that some 95% of all money transactions are now electronic/digital/cyber transactions. This new money system is still experimental as it has only flourished for some 10 years (fully). Our historical money units (silver and gold) are now controlled, monitored, and suppressed to prevent any growing sentiment for these historical/constitutional monies. This can be done by our central planners via an algorithm. Algo’s are now the means for creating all our prices and this happens via our HFT computers which trade all our markets. Even our central banks trade our markets today to prevent any crash of the system. All this changed and evolved after the 2008 financial crisis. Our official authorities assume that this machine driven monetary system will replace all prior money systems (paper notes, coins, and precious metals). A cashless money system is now our global system. With robots and artificial intelligence along with algorithms sourced to trade our markets, it is assumed that our cyber/electronic markets can go up forever (eliminating any historical business cycles). So far these assumptions seem to be working. Expectations are that growth will continue (now at 3.9% for 2018 and 2019). The past 111 months have revealed that these electronic/cyber markets can go up without any major correction (20% or more) indefinitely. Today’s, WSJ, states that our IMF expects a 3.9% GDP growth for our markets for 2018 and 2019. There is no expectation of a crash of these machine driven markets (within the halls of our official institutions). If any dire event happens, our central planners can simply flood the markets with new digital units of consciousness to over-ride a real correction. Since our money is now inner and living within our extended consciousness (called cyberspace), it could be possible to pump up these inner markets indefinitely via computer operations originating from venues which our central banks control. Sentiment for digital money must continue and this means that our historical/constitutional money must be continually suppressed. Suppression is easy today as our central planners trade our markets. We now have electronic futures markets which allow ‘short’ selling of silver and gold in unlimited amounts. This short selling is ‘naked’ as no settlement in these metals is required. This means that price suppression can continue indefinitely via a trading algorithm or similar trading strategy. Our SEC and the CFTC seem oblivious to these trading gimmicks which are now ubiquitous on our electronic exchanges. Our planet has some 65 major electronic exchanges today. These electronic stock exchanges have continued to go up and up for some 111 months (since March of 2009). We are now in July of 2018 and I see no evidence that policies of our central planners have changed. This means more of the same and no major stock correction for the time being. The master trading computers within venues controlled by our central planners can assure that markets continue to go up (with minor down stretches) continually. I doubt if a nuclear war in the Middle East would crash our markets. Computers, AI, algorithms, and automated trading could override any dire event. Our Central Planners could program a computer to trade our electronic markets as the nuclear war was occurring. The stock markets could go up and up while mass destruction of buildings and people occur in real-time. All this is now possible with our machine driven markets. Inner money has replaced outer money. I call our current system a metaphysical system of inner trading units. Mere cyber numbers are being traded as our money. Cyber money is inner money and no-one can stop our central planners without having control of their computer venues. A computer in Basel, Frankfurt, London, Tokyo, or New York could continue to trade as dire geo-political events are happening. I am shocked that so few investors and pundits understand what is happening within our inner markets. Money is now inner. Inner money was invented by our central bank administrators. Most think of these inner digital units as real. But, in reality, they are metaphysical. The Mark of the Beast economy is here. Will our spiritual Creator bring these markets down? That is the 64,000 question. Only our Creator can change our markets today IMO. Think for yourself on all this! I am: https://kingdomecon.wordpress.com. ← The Dollar: A Unit of Consciousness – Circulating in Cyberspace!